Classic Assessments are regularly commissioned by various specialist magazines, insurance brokers, insurance companies, solicitors and courts to provide vehicle inspections and reports, with recent work for Practical Classics and Classic Cars Magazines, Classic Car Mart publication and Cloud Nine Classic yearbook, amongst others. "I have been very pleased with the service you have provided and will certainly have no hesitation in recommending you to my friends and colleagues." 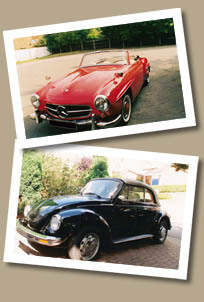 Classic Assessments are Specialists in assessing and valuing Vintage, Classic and Thoroughbred vehicles. We cover any location in the UK and almost everywhere worldwide. We provide independent vehicle inspections including Pre-Purchase Inspections, Vehicle Valuations, Modified Vehicle and Engineers Reports, Accident Assessments and Restoration Estimation and Project Management Services. 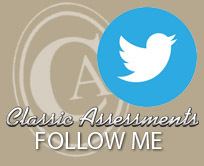 Also Classic Assessments can provide Vehicle Event Management and Arena Commentaries. We have a wide range of experience with many makes and models, in fact anything from simple sidevalve Austins and Fords to V12 Ferraris and almost anything in between. Our Pre-Purchase Inspection and Vehicle Valuation services and reports are recommended and recognised by various vehicle clubs and we have a wide range of experience with many makes and models, including Aston Martin, Austin Healey, BMW, Daimler, Jaguar, Jensen, MG, Mercedes-Benz, Riley, Rover, Triumph and Rootes Group cars, to name just a few. In fact we have inspected anything from simple side valve Austins to V12 Ferraris and almost anything in between. Classic Assessments is often commissioned for Vehicle Assessments, Pre-Purchase Inspections and Vehicle Valuations by various Motoring Publications and Auction Houses. Our Classic Car Inspections are recommended by numerous Vehicle Clubs, including the TR Register, MG Car Club, Jaguar Enthusiasts Club, the Austin Healey Club, Daimler SP250 Owners Club and the Allard Owners Club, etc. We also carry out Insurance Valuations and Pre-Purchase Inspections on Historic Commercial Vehicles, Passenger Service Vehicles and Pre-80 Motorcycles. Classic Assessments for Classic Car Inspections, Pre-Purchase Inspections, Classic Car Valuations, Expert Witness Reports, Accident Assessments, Restoration Management and Vehicle Valuations. Classic Assessments was established in 1993 and has carried out over 2,500 vehicle inspections throughout the UK, and have clients from all over the world including Austria, Australia, Belgium, Canada, Cyprus, Denmark, France, Germany, Greece, Hong Kong, Italy, Japan, Kuwait, Malta, Netherlands, Norway, Spain, Singapore, Saudi Arabia, South Africa, Sweden, Switzerland, USA and Zimbabwe.